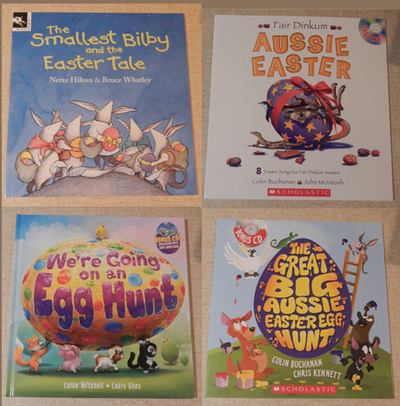 Below are some more titles that have been released for children to celebrate the upcoming Easter period. For some reason, bilbies have become associated with Easter in Australia- perhaps because they are the only native animal that has a close resemblance to the traditional Easter rabbit. Whatever the case, this similarity has allowed many authors to create a more Australiana-themed story when it comes to Easter tales, with popular children’s author Nette Hilton taking full advantage. It’s the night before Easter, and the rabbits have given the bilbies the important job of delivering the eggs to all the bush animals. They have to go quickly and quietly, making sure that no one is woken up, and no one misses out. The bilbies are more than happy to attend to the task, and soon there are eggs hidden all over the place. 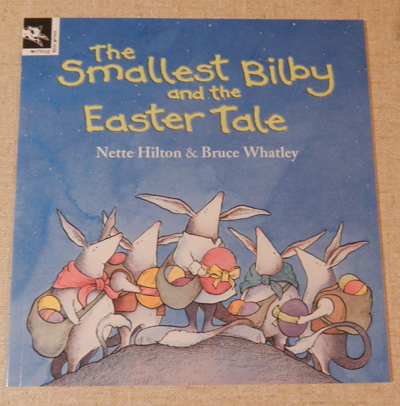 But then Brush gets into a spot of trouble, and it’s up to Billy and the other bilbies to help her. Will they have time to get her to safety and finish the delivery job for the rabbits before Easter morning dawns? This picture story book features Whatley’s cute illustrations, and children will love the imagery of the bilbies secretly hiding the eggs around (and on!) the sleeping bush animals. Children will also have the chance to learn from this representation of the Easter spirit, where the bilbies care for and help each other in times of need. Colin Buchanan is an Australian entertainer, best known for his stint as a presenter on the children’s television show Play School in the 1990s. He has written many songs over the length of his career, including eight about Easter, which are distinctly Australian and can be found in this book. 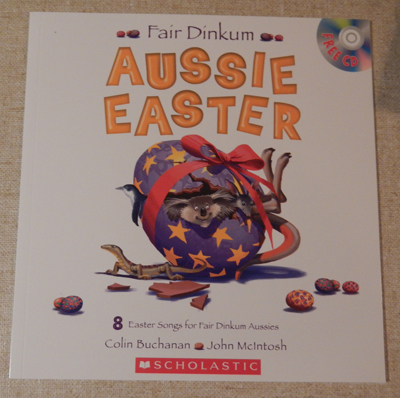 In the back of the book is a CD, featuring the vocals and guitar talents of Colin Buchanan himself, as he sings about Easter egg hunts across Australia, hot cross buns and Easter hat parades. While all of the lyrics are original, Buchanan has borrowed the tunes of a few Aussie songs (like Click Go The Shears, Advance Australia Fair and Waltzing Matilda) to accompany the words to some of them. John McIntosh’s illustrations are entertaining, and children will delight at seeing the familiar Easter scenes drawn from an Australian perspective. The CD runs for just under 18 and a half minutes, so parents can hand their children the book, and leave them to sing along while they have a short break. Alternatively, they can sit down with the kids and join in the fun- who doesn’t love an Aussie-themed Easter songfest! Taking a leaf from the children’s classic We’re Going On A Bear Hunt (written by Michael Rosen) is this delightful story about a fox, pig, goat, cat and chicken who are out to find some Easter eggs. Along the way to discover the Easter egg hiding place, they encounter a bird’s nest, a hedge maze, a garden, puffy clouds, and a rabbit-shaped warren- but where are the hidden chocolate eggs? Using the now famous (and nostalgic) lines, ‘We can’t go over it. We can’t go under it. We’ll have to go through it!’, the author makes the Egg Hunt journey fun for all ages. Children will love the cute illustrations as the animals search high and low for their chocolate fix, and will enjoy looking for the Easter bunny hidden on each page. Better yet, they can sing along as they turn the pages- the book features a sing-along CD, performed by popular television actor, presenter and stage star Jay Laga’aia. On the CD, the first track is sung by Laga’aia, and the second is an instrumental version, so the kids can put on their own show and recreate the scenes in the book. 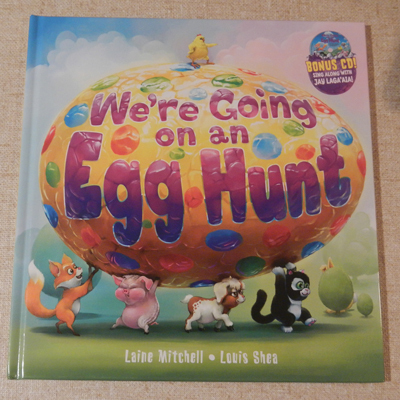 This book is sure to provide the perfect finish to an exciting Easter Egg hunt. 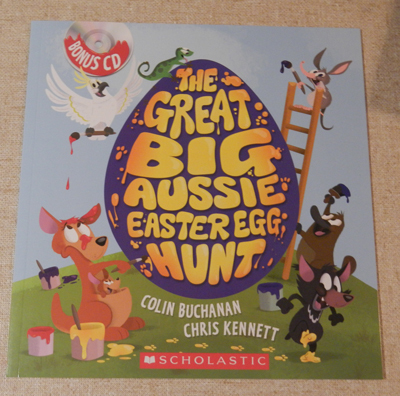 Colin Buchanan has certainly been busy- the man is behind yet another Australian-themed Easter book, this time aimed at a slightly younger audience (as judged by the illustrations). In this book, there is another sing-along CD, however this one only features the one song (and an instrumental version). This song follows the same tune as his song of the same name (which can be found in the Fair Dinkum Aussie Easter book), but the lyrics are slightly different, and feature lots of different Australian animals as they search across the country for chocolate eggs. The native animals search ‘high and low’ to find the Easter egg bounty, travelling from Kakadu to the MCG in Melbourne. Hiding somewhere on every page is a little bilby- the Australian animal synonymous with Easter and delivering eggs, and children will have fun trying to spot him. If you want to teach your child about different places in Australia, and want to educate them about the various animals that inhabit it, then this book is sure to cover plenty. Not only will they get to learn these important facts, but they will get to sing along to a fun Aussie-themed Easter song (hopefully while eating chocolate eggs they found during their own Easter Egg Hunt). What more could you want?